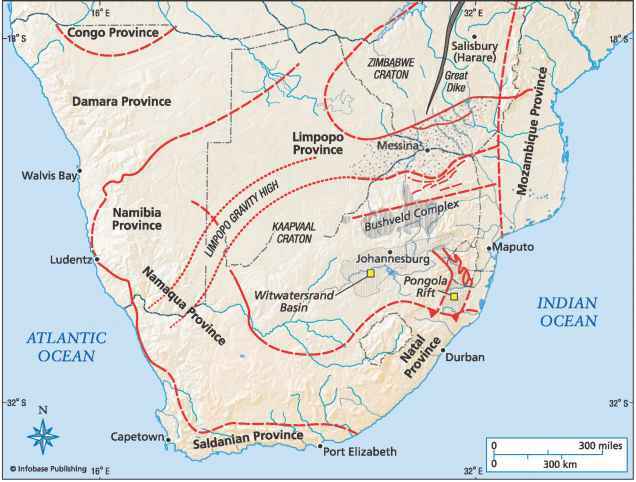 In 1911 Holmes obtained a position as a geological prospector for Memba Minerals Limited. After giving his research results to Strutt, Holmes left England for Mozambique in March, beginning a physically difficult six-month expedition in search of economically valuable minerals. While there, Holmes contracted malaria, and high fevers occasionally forced him to rest for several days. Lying in bed, he could not stop thinking about radiometric dating and contemplated how he could reconcile data obtained by radiomet-ric methods with data calculated from sedimentation rates. Without access to geology textbooks or journals, he used his memory to approximate the amount of original igneous rocks from which sediments had been derived, then figured out how long it would have taken for the sediments to be deposited. His estimate was 325 million years since the base of the Cambrian period, not too far from the value of 543 million years that he obtained using radiometric methods. He wrote a friend asking him to publish his results. Though prospecting for precious minerals was unsuccessful in Mozambique, during the trip Holmes developed a lifelong interest in Precam-brian time and a new commitment to constructing a geological timescale. He collected zircons, minerals good for age determinations, and several samples of never-examined Precambrian rock types. As the prospectors headed home, Holmes became gravely ill with black water fever. The nuns at the hospital in Mozambique prematurely telegraphed news of his death to London, but Holmes miraculously recovered and arrived in Southampton in November 1911. He continued to suffer from bouts of malaria for years afterward.